‘The Blackberries’ camping park is open from Friday 2nd March 2018. Small part open / part wooded family run Camping Park, set in the quiet of the Wiltshire countryside yet only a ‘stone’s throw’ from the beautiful historic city of Bath. ‘The Blackberries’ offers a choice of ‘Glamping’ in wooden ‘Pods’, ‘Shepherd’s Huts’ and our beautifully kitted out Bell Tent for up to 6 people, available from May. Of course, you can still pitch your own Tent, Motorhome or Caravan. All pitches and accommodation must be vacated by 11am. ALL Arrivals to be between 1pm and 5pm – later times are strictly by prior arrangement. Large, Level, Hard standing for most pitches with grassed areas. All pitches have a built-in FirePit – (please note that wood must not be collected from the site woodland. Large logs of ‘green’ wood do not burn. We do acknowledge that children enjoy collecting kindling for the fire and this is permitted. All wood burned on the firepits must be pre-cut. Bags of pre-cut wood may be purchased on site). Low level lighting is available on site but is kept to a minimum so that nightlife is not disturbed which includes the ancient bat colony that nests at the nearby ‘Browns Folly’. Please remember to bring a torch! Please do not hesitate to contact the owners, Beryl and Adrian for help and information at any time during your stay at ‘The Blackberries’. We are here to help you. 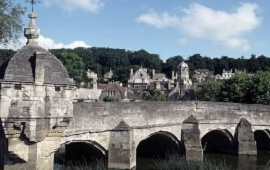 The picturesque market town of Bradford-on-Avon has numerous interesting places to visit including; 14th Century Tithe Barn, Saxon Church and Countryside Park. Take a walk or cycle ride alongside the canal or river or enjoy the local indoor swimming pool. We want everyone to enjoy their stay at ‘The Blackberries’ Camping Park and keep the rules and regulations to a minimum. However we respectfully ask that you use the following as a guideline, our aim is to facilitate a happy and restful time for all. All monies to be paid at the time of booking. A full refund may be given if at least 28 days notice of cancellation is given. DOGS MUST BE EXERCISED OFF THE SITE AND KEPT ON LEADS AT ALL TIMES WHEN ON SITE. Please dispose of all waste in the bins provided. This is a family friendly site and therefore children will be playing. Please be mindful of this when driving on the site. All small children must be supervised at all times and parents/guardians are responsible for their safety. The Blackberries is valued as a quiet and peaceful site and is not suitable for ball games e.g. football.